The Seneca (/ˈsɛnɪkə/) are a group of indigenous Iroquoian-speaking people native to North America who historically lived south of Lake Ontario. They were the nation located farthest to the west within the Six Nations or Iroquois League (Haudenosaunee) in New York before the American Revolution. In the 21st century, more than 10,000 Seneca live in the United States, which has three federally recognized Seneca tribes. Two are in New York: the Seneca Nation of New York, with two reservations in western New York near Buffalo; and the Tonawanda Band of Seneca Native Americans. The Seneca-Cayuga Nation is located in Oklahoma, where their ancestors were relocated from Ohio during Indian Removal. Approximately 1,000 Seneca live in Canada, near Brantford, Ontario, at the Six Nations of the Grand River First Nation. They are descendants of Seneca who resettled there after the American Revolution, as they had been allies of the British and forced to cede much of their lands. A legend of the Seneca tribe states that the tribe originated in a village called Nundawao, near the south end of Canandaigua Lake, at South Hill. Close to South Hill stands the 865 foot (264 m)-high Bare Hill, known to the Seneca as Genundowa. Bare Hill is part of the Bare Hill Unique Area, which began to be acquired by the state in 1989. Bare Hill had been the site of a Seneca or pre-Seneca indigenous fort. The first written reference to this fort was made in 1825 by David Cusick in his history of the Seneca Indians. The traces of an ancient fort, covering about an acre, and surrounded by a ditch, and formerly by a formidable wall, are still to be seen on top of Bare Hill. They indicate defenses raised by Indian hands, or more probably belong to the labors of a race that preceded the Indian occupation. The wall is now about tumbled down, the stones seem somewhat scattered, and the ground is overgrown with brush. In the early 1920s, the material that made up the Bare Hill fort was used by the Town of Middlesex highway department for road fill. The Seneca traditionally lived in what is now New York state between the Genesee River and Canandaigua Lake. The dating of an oral tradition mentioning a solar eclipse yields 1142 AD as the year for the Seneca joining the Iroquois (Haudenosaunee). Some recent archaeological evidence indicates their territory eventually extended to the Allegheny River in present-day northwestern Pennsylvania, particularly after the Iroquois destroyed both the Wenrohronon and Erie nations in the 17th century, who were native to the area. The Seneca were by far the most populous of the Haudenosaunee nations, numbering about four thousand by the seventeenth century. Seneca villages were located as far east as current-day Schuyler County (e.g. Catherine's Town and Kanadaseaga), south into current Tioga and Chemung counties, north and east into Tompkins and Cayuga counties, and west into the Genesee River valley. The villages were the homes and headquarters of the Seneca. While the Seneca maintained substantial permanent settlements and raised agricultural crops in the vicinity of their villages, they also hunted widely through extensive areas. They prosecuted far-reaching military campaigns. The villages, where hunting and military campaigns were planned and executed, indicate the Seneca had hegemony in these areas. Major Seneca villages were protected with wooden palisades. Ganondagan, with 150 longhouses, was the largest Seneca village of the 17th century, while Chenussio, with 130 longhouses, was a major village of the 18th century. The Seneca had two branches; the western and the eastern. Each branch distinct, they were individually incorporated and recognized by the Iroquois Confederacy Council. The western Seneca lived predominately in and around the Genesee River, gradually moving west and southwest along the Erie and Niagara rivers, then south along the Allegheny River into Pennsylvania. The eastern Seneca lived predominantly south of Seneca Lake. They moved south and east into Pennsylvania and the western Catskill area. The west and north were under constant attack from their powerful Iroquoian brethren, the Huron (Wyandot) To the South, the Iroquoian-speaking tribes of the Susquehannock (Conestoga) also threatened constant warfare. The Algonkian tribes of the Mohican blocked access to the Hudson River in the east and northeast. In the southeast, the Algonkian tribes of the Lenape people (Delaware, Minnisink and Esopus) threatened war from eastern Pennsylvania, New Jersey and the Lower Hudson. The Seneca used the Genesee and Allegheny rivers, as well as the Great Indian War and Trading Path (the Seneca Trail), to travel from southern Lake Ontario into Pennsylvania and Ohio (Merrill, Arch. Land of the Senecas; Empire State Books, 1949, p 18-25). The eastern Seneca had territory just north of the intersection of the Chemung, Susquehanna, Tioga and Delaware rivers, which converged in Tioga. The rivers provided passage deep into all parts of eastern and western Pennsylvania, as well as east and northeast into the Delaware Water Gap and the western Catskills. The men of both branches of the Seneca wore the same head gear. Like the other Haudenosaunee, they wore hats (basically) with dried cornhusks on top. The Seneca had one feather sticking up straight. Traditionally, the Seneca Nation's economy was based on hunting and gathering activities, fishing, and the cultivation of varieties corn, beans, and squash. These vegetables were the staple of the Haudenosaunee diet and were called "the three sisters". Seneca women generally grew and harvested varieties of the three sisters, as well as gathering and processing medicinal plants, roots, berries, nuts, and fruit. Seneca women held sole ownership of all the land and the homes. The women also tended to any domesticated animals such as dogs and turkeys. The Iroquois had a matrilineal kinship system; inheritance and property descended through the maternal line. Women were in charge of the kinship groups called clans. Children were considered born into their mother's clan and took their social status from her family. Their mother's eldest brother was generally more of a major figure in their lives than their biological father, who did not belong to their clan. The presiding elder of a clan was called the "clan mother". Despite the prominent position of women in Iroquois society, their influence on the diplomacy of the nation was limited. If the "clan mothers" did not agree with any major decisions made by the chiefs, they could eventually depose them. Seneca men were generally in charge of locating and developing the town sites, including clearing the forest for the production of fields. Seneca men also spent a great deal of time hunting and fishing. This activity took them away from the towns or villages to well-known and productive hunting and fishing grounds for extended amounts of time. These hunting and fishing locations were altered and well maintained to encourage game; they were not simply "wild" lands. Seneca men maintained the traditional title of war sachems within the Haudenosaunee. A Seneca war sachem was in charge of gathering the warriors and leading them into battle. Seneca people lived in villages and towns. Archaeological excavations indicate that some of these villages were surrounded by palisades because of warfare. These towns were relocated every ten to twenty years as soil, game and other resources were depleted. During the nineteenth century, many Seneca adopted customs of their immediate American neighbors by building log cabins, practicing Christianity, and participating in the local agricultural economy. During the colonial period, the Seneca became involved in the fur trade, first with the Dutch and then with the British. This served to increase hostility with competing native groups, especially their traditional enemy, the Huron (Wyandot), an Iroquoian-speaking tribe located near Lac Toronto in New France. In 1685, King Louis XIV of France sent Marquis de Denonville to govern New France in Quebec. Denonville set out to destroy the Seneca Nation and in 1687 landed a French armada at Irondequoit Bay. Denonville struck straight into the seat of Seneca power and destroyed many of its villages, including the Seneca's eastern capital of Ganondagan. Fleeing before the attack, the Seneca moved further west, east and south down the Susquehanna River. Although great damage was done to the Seneca home land, the Seneca's military might was not appreciably weakened. The Confederacy and the Seneca moved into an alliance with the British in the east. (Houghton at 244). In and around 1600, the area currently comprising Sullivan, Ulster and Orange counties of New York was home to the Lenape Indians, an Algonquian-speaking people whose territory extended deep along the coastal areas of the mid-Atlantic coast, up into present-day Connecticut. They occupied the western part of Long Island as well. The Lenape nation was Algonkian-speaking and made up of the Delaware, Minnisink and Esopus bands, differentiated according to their territories. These bands later became known as the Munsee, based on their shared dialect. (Folts at pp 32) The Munsee inhabited large tracts of land from the middle Hudson into the Delaware Water Gap, and into northeast Pennsylvania and northwest New Jersey. The Esopus inhabited the Mid-Hudson valley (Sullivan and Ulster counties). The Minnisink inhabited northwest New Jersey. The Delaware inhabited the southern Susquehanna and Delaware water gaps. The Minnisink-Esopus trail, today's Route 209, helped tie this world together. To the west of the Delaware nation were the Iroquoian-speaking Andaste/Susquehannock. To the east of the Delaware Nation lay the encroaching peoples of Dutch New Netherland. From Manhattan, up through the Hudson, the settlers were interested in trading furs with the Susquehannock occupying territory in and around current Lancaster, Pennsylvania. As early as 1626, the Susquehannock were struggling to get past the Delaware to trade with the Dutch in New Amsterdam (Manhattan). In 1634, war broke out between the Delaware and the Susquehannock, and by 1638, the defeated Delaware became tributaries to the Susquehanna. The Iroquois Confederacy to the north was growing in strength and numbers, and the Seneca, as the most numerous and adventurous, began to travel extensively. Eastern Seneca traveled down the Chemung River to the Susquehanna River. At Tioga the Seneca had access to every corner of Munsee country. Seneca warriors traveled the Forbidden Path south to Tioga to the Great Warrior Path to Scranton and then east over the Minnisink Path through the Lorde's valley to Minnisink. The Delaware River path went straight south through the ancient Indian towns of Cookhouse, Cochecton and Minnisink, where it became the Minsi Path. In 1657 and 1658, the Seneca visited, as diplomats, Dutch colonial officials in New Amsterdam. In 1659 and 1660, the Seneca interceded in the First Esopus War, which was going on between the Dutch and Esopus at current-day Kingston. The Seneca chief urged Stuyvesant to end the bloodshed and "return the captured Esopus savages". In 1675, after a decade of warfare between the Iroquois (mainly the Mohawk and Oneida) and the Andaste/Susquehannock, the Seneca finally succeeded in vanquishing their last remaining great enemy. (Parker at pp 49) Survivors were colonized in settlements along the Susquehanna River and were assimilated into the Seneca and Cayuga people. In 1694, Captain Arent Schuyler, in an official report, described the Minnisink chiefs as being fearful of being attacked by the Seneca because of not paying wampum tribute to these Iroquois. Around 1700, the upper Delaware watershed of New York and Pennsylvania became home of the Minnisink Indians moving north and northwest from New Jersey, and of Esopus Indians moving west from the Mid-Hudson valley. By 1712, the Esopus Indians were reported to have reached the east Pepacton branch of the Delaware River, on the western slopes of the Catskill Mountains. From 1720 to the 1750s, the Seneca resettled and assimilated the Munsee into their people and the Confederacy. Historical accounts had noted the difficulties encountered by the Seneca during this period and noted a dissolution of their traditional society under pressure of disease and encroachment by European Americans. But fieldwork at the 1715-1754 Seneca Townley-Read site near Geneva, New York, has recovered evidence of "substantial Seneca autonomy, selectivity, innovation, and opportunism in an era usually considered to be one of cultural disintegration". In 1756, the Confederacy directed the Munsee to settle in a new satellite town in Seneca territory called Assinisink (where Corning developed) on the Chemung River. In this period, they developed satellite towns for war captives who were being assimilated near several of their major towns. The Seneca received some of the Munsee's war prisoners as part of their negotiations. At a peace conference in Easton, Pennsylvania in 1758, the Seneca chief Tagashata required the Munsee and Minnisink to conclude a peace with the colonists and "take the hatchet out of your heads, and bury it under ground, where it shall always rest and never be taken up again". A large delegation of Iroquois attended this meeting to demonstrate that the Munsee were under their protection. In 1759, as colonial records indicate, negotiators had to go through the Seneca in order to have diplomatic success with the Munsee. Despite the French military campaigns, Seneca power remained far-reaching at the beginning of the 18th century. Gradually, the Seneca began to ally with their trading partners, the Dutch and British, against France's ambitions in the New World. By 1760 during the Seven Years' War, they helped the British capture Fort Niagara from the French. The Seneca had relative peace from 1760 to 1775. In 1763 a Seneca war party ambushed a British supply train and soldiers in Battle of Devil's Hole, also known as the Devil's Hole massacre, during Pontiac's Rebellion. After the American Revolutionary War broke out between the British and the colonists, the Seneca at first attempted to remain neutral but both sides tried to bring them into the action. When the rebel colonists defeated the British at Fort Stanwix, they killed many Seneca onlookers. The Seneca Tribe before the American Revolution had a prosperous society. The Iroquois Confederacy had ended the fighting amongst the war-based Iroquois tribes and allowed them to live in peace with each other. Yet, despite this peace amongst themselves, the Iroquois tribes were all revered as fierce warriors and were reputed to control together a large empire that stretched hundreds of miles along the Appalachian Mountains. The Seneca were a part of this confederacy with the Cayuga, Onondagas, Oneidas, Mohawks, and, later on, the Tuscaroras. However, although the Seneca and Iroquois tribes had ceased fighting each other, they still continued to conduct raids on outsiders, or rather their European visitors. Despite the Iroquois continuing raids on their new European neighbors, the Iroquois tribes struck up profitable relationships with the Europeans, especially the English. In 1677, the English were able to make an alliance with the Iroquois league called the "Covenant Chain". In 1768, the English renewed this alliance when Sir William Johnson, 1st Baronet signed the Treaty of Fort Stanwix in 1768. This treaty put the British in good favor with the Iroquois, as they felt that the British had their best interests in mind as well. The Americans, unlike the British, were disliked by the Seneca because of their continual disregard for the Treaty of Fort Stanwix. Specifically, the Iroquois were enraged by the Americans movement into the Ohio Territory. However, despite their continual encroachment on established Iroquois land, the Americans respected their skills at warfare and attempted to exclude from their conflict with the British. The Americans viewed their conflict with the British as a conflict meant to include only them. The Albany Council occurred in August, and the Iroquois Confederacy debated about the Revolution from August 25 to August 31. The non-Iroquois present at the council consisted of important figures like Philip Schuyler, Oliver Wolcott, Turbutt Francis, Volkert Douw, Samuel Kirkland, and James Dean. The Iroquois at the council were representatives from all the tribes, but the Mohawk, Oneidas, and Tuscaroras had the most representatives. The Iroquois agreed with the Americans and decided at their Albany Council that they should remain as spectators to the conflict. A Mohawk Chief named Little Abraham declared that "the determination of the Six Nations not to take any part; but as it is a family affair, to sit still and see you fight it out". Thus, the Iroquois chose to remain neutral for the time being. They felt it would be best to stand aside while the Colonists and the British battled. They did not wish to get caught up in this supposed "family quarrel between [them] and Old England". Despite this neutrality, the anti-Native American rhetoric of the Americans pushed the Iroquois over to the side of the British. The Americans put forth an extremely racist and divisive message. They viewed the Iroquois and other Native Americans as savages and lesser people. An example of this rhetoric came in the Declaration of Independence: "the merciless Indian Savages, whose known rule of warfare, is an undistinguished destruction of all ages, sexes, and conditions." As a result of this terrible rhetoric, many Mohawk, Cayuga, Onondaga, and Seneca prepared to join the British. However, many Oneida and Tuscarora were able to be swayed by an American missionary, Samuel Kirkland. The Iroquois nation began to divide as the Revolution continued and, as a result, they extinguished the council fire that united the six Iroquois nations, therefore ending the Iroquois Confederacy. The Iroquois ended their political unity during the most turbulent time in their history. Two powers in the midst of battle pulled them apart to gain their skill as warriors. This divided the Iroquois and the tribes chose sides based on preference. In addition to the push of American bigoted rhetoric, the British, also, continued to attempt to sway the Iroquois towards their side. One British's attempt to sway the Iroquois were described by two Seneca tribesmen, Mary Jemison and Governor Blacksnake. They both described the grandeur of the lavish gifts that the British bestowed upon the Iroquois. Governor Blacksnake's account held many details about the luxurious treatment that they received from the British: "[I]mmediately after arrival the officers came to see us to See what wanted for to Support the Indians with prvisions and with the flood of Rum. they are Some of the ... warriors made use of this intoxicating Drinks, there was several Barrel Delivered to us for us to Drinked for the white man told us to Drinked as much as we want of it all free gratus, and the goods if any of us wishes to get for our own use." Contingent to this generosity was the loyalty of the Iroquois to the British. The Iroquois debated whether to side with the British or not. An argument to remain neutral until further development came from Governor Blacksnake's uncle Cornplanter, but Joseph Brant twisted his recommendation to wait as a sign of cowardice. The British noticed that the Indian warriors were divided on the issue, so the British presented them with rum, bells, ostrich feathers, and a covenant belt. The Americans attempted a similar wine and dine method on the Tuscarora and Oneidas. In the end, the Mohawk, Onondaga, Cayuga, and Seneca sided with the British, and the Tuscarora and Oneida sided with the Americans. From this point on, the Iroquois would have a serious role in the American Revolution. The war divided them and now they would be fighting against each other from 1777 till the end on opposite sides. The Seneca chose to side with the British in the American Revolution. 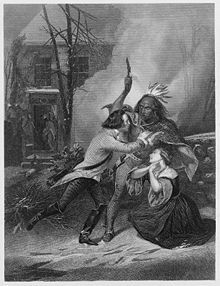 One of the earliest battles the Iroquois were involved in occurred on August 6, 1777, in Oriskany During the Battle of Oriskany, Native Americans led a brutal attack against the rebel Americans where they "killed, wounded, or captured the majority of patriot soldiers". The Seneca Governor Blacksnake described the battle from the viewpoint of the victorious Indians: "as we approach to a firghting we had preparate to make one fire and Run amongst them we So, while we Doing it, feels no more to Kill the Beast, and killed most all, the americans army, only a few white man Escape from us ... there I have Seen the most Dead Bodies all it over that I neve Did see." Author Ray Raphael made a connection between the Seneca warriors and Continental Army soldiers by noting that Blacksnake "was not unlike" known Revolutionary veterans "Joseph Plumb Martin and James Collins and other white American [veterans] who could never finally resolve whether killing was right or wrong". As the war went on, many more brutal attacks and atrocities would be committed by both sides, notably the Sullivan Expedition, which devastated Iroquois and Seneca lands. The Iroquois were involved in numerous other battles during the American Revolution. Notable raids like the Cherry Valley massacre and Battle of Minisink, were carefully planned raids on a trail laid out "from the Susquehanna to the Delaware Valley and over the Pine Hill to the Esopus Country". In 1778 Seneca, Cayuga, Onondaga, and Mohawk warriors conducted raids on white settlements in the upper Susquehanna Valley. Although the Iroquois were active participants, Seneca like Governor Blacksnake were extremely fed up with the brutality of the war. He noted particularly on his behavior at Oriskany, and how he felt "it was great sinfull by the sight of God". Warriors like Blacksnake were feeling the mental toll of killing so many people during the American Revolution. As Raphael noted in his book, "warfare had been much more personal" for the Iroquois before the American Revolution. During the revolution, these once proud Iroquois were now reduced to conducting brutal acts such as the killing of women and children at the Cherry Valley massacre and the clubbing of surviving American soldiers at Oriskany. Although Seneca like Governor Blacksnake felt sorrow for their brutal actions, the Americans responded in a colder and more brutal fashion. This retaliation came in the Sullivan Expedition. The planning of the Sullivan Expedition began in 1778 as a way to respond to the Iroquois victories and massacres. This plan came about from the complaints of New Yorkers at the Continental Congress. The New Yorkers had suffered from the massive Iroquois offensives from 1777 to 1778, and they wanted revenge. Besides the brutal battles described previously, the New Yorkers were especially concerned with Joseph Brant. Joseph Brant had Mohawk parents and British lineage, and at a young age, he was taken under the superintendent for Indian affairs. Brant grew to be a courteous and well-spoken man, and he took up the fight for the British because of harassment and discrimination from the Americans during the lead-up to the American Revolution. Thus, Brant formed a military group known as Brant's Volunteers, which consisted of Mohawks and Loyalists. Brant and his band of volunteers led many raids against hamlets and farms in New York, especially Tryon County. As a result of Brant's exploits, the Iroquois offensives, and several massacres the Iroquois inflicted against colonial towns, in 1778 the Seneca and other western nations were attacked by United States forces as part of the Sullivan Expedition. George Washington called upon Continental Army General John Sullivan (general) to lead this attack upon the Iroquois. 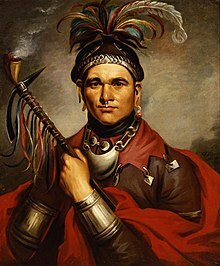 He had received anywhere from 3000 to 4500 soldiers to wreak havoc upon the helpless Iroquois. Overall, the Sullivan Expedition wreaked untold havoc and destruction upon the Iroquois lands, as the soldiers "destroy[ed] not only the homes of the Iroquois but their food stocks as well". Seneca woman Mary Jemison recalled how the Continental soldiers "destroyed every article of the food kind that they could lay their hands on". To make matters worse for the Iroquois, an especially hard winter in 1780 caused additional suffering for the downtrodden Iroquois. The Sullivan Expedition highlighted a period of true total war within the American Revolution. The Americans looked to cripple the Iroquois. They accomplished that, but they instilled a deep hatred in the Iroquois warriors. After the Sullivan Expedition, the recovered Seneca, Cayuga, Onondaga, and Mohawk, angered by the destruction caused, resumed their raids on American settlements in New York. These Iroquois tribes not only attacked and plundered the American colonists, they, also, set fire to Oneida and Tuscarora settlements. The Iroquois continued their attacks upon the Americans, even after General Charles Cornwallis, 1st Marquess Cornwallis had surrendered at Yorktown in 1781. They did not stop until their allies had caved in and surrendered. In 1782, the Iroquois had finally stopped fighting when the British General Frederick Haldimand recalled them "pending the peace the negotiations in Paris". The Iroquois, also seemed to have a much larger knowledge of the war beyond the scope of New York. A letter from 1782 written by George Washington to John Hanson described intelligence captured from the British. In the letter, British soldiers encounter a group of Native Americans, and a discussion ensues. A soldier by the name of Campbell informs the Native Americans that the war ended and the Americans expressed their sorrow for the war. However, an unknown Seneca sachem informed the British "that the Americans and [F]rench had beat the English, that the latter could no longer carry on the War, and that the Indians knew it well, and must now be sacrificed or submit to the Americans". With the Iroquois League dissolved, the nation settled in new villages along Buffalo Creek, Tonawanda Creek, and Cattaraugus Creek in western New York. The Seneca, Onondaga, Cayuga, and Mohawk, as allies of the British, were required to cede all their lands in New York State at the end of the war, as Britain ceded its territory in the Thirteen Colonies to the new United States. The late-war Seneca settlements were assigned to them as their reservations after the Revolutionary War, as part of the Treaty of Fort Stanwix in 1784. Although the Oneida and Tuscarora were allies of the rebels, they were also forced to give up most of their territory. On November 11, 1794, the Seneca (along with the other Haudenosaunee nations) signed the Treaty of Canandaigua with the United States, agreeing to peaceful relations. On September 15, 1797, at the Treaty of Big Tree, the Seneca sold their lands west of the Genesee River, retaining ten reservations for themselves. The sale opened up the rest of Western New York for settlement by European Americans. On January 15, 1838, the US and some Seneca leaders signed the Treaty of Buffalo Creek, by which the Seneca were to relocate to a tract of land west of the state of Missouri, but most refused to go. The majority of the Seneca in New York formed a modern elected government, the Seneca Nation of Indians, in 1848. The Tonawanda Band of Seneca Indians split off, choosing to keep a traditional form of tribal government. Both tribes are federally recognized in the United States. While it is not known exactly how many Seneca there are, approximately 10,000 Seneca live near Lake Erie. About 7,800 people are citizens of the Seneca Nation of Indians. These members live or work on five reservations in New York: the Allegany (which contains the city of Salamanca); the Cattaraugus near Gowanda, New York; the Buffalo Creek Territory located in downtown Buffalo; the Niagara Falls Territory located in Niagara Falls, New York; and the Oil Springs Reservation, near Cuba. Few Seneca reside at the Oil Springs, Buffalo Creek, or Niagara territories due to the small amount of land at each. The last two territories are held and used specifically for the gaming casinos which the tribe has developed. The Tonawanda Band of Seneca Indians has about 1,200 citizens who live on their Tonawanda Reservation near Akron, New York. 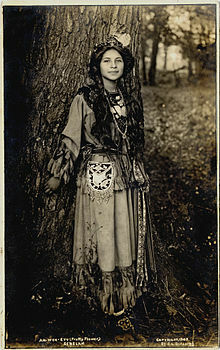 The third federally recognized tribe is the Seneca-Cayuga Tribe of Oklahoma who live near Miami, Oklahoma. They are descendants of Seneca and Cayuga who had migrated from New York into Ohio before the Revolutionary War, under pressure from European encroachment. They were removed to Indian Territory west of the Mississippi River in the 1830s. Many Seneca and other Iroquois migrated into Canada during and after the Revolutionary War, where the Crown gave them land in compensation for what was lost in their traditional territories. Some 10,000 to 25,000 Seneca are citizens of Six Nations and reside on the Grand River Territory, the major Iroquois reserve, near Brantford, Ontario. Enrolled members of the Seneca Nation also live elsewhere in the United States; some moved to urban locations for work. The federal government through the Corps of Engineers undertook a major project of a dam for flood control on the Allegheny River. The proposed project was planned to affect a major portion of Seneca territory in New York. Begun in 1960, construction of the Kinzua Dam on the Allegheny River forced the relocation of approximately 600 Seneca from 10,000 acres (40 km2) of land which they had occupied under the 1794 Treaty of Canandaigua. They were relocated to Salamanca, near the northern shore of the Allegheny Reservoir that resulted from the flooding of land behind the dam. The Seneca had protested the plan for the project, filing suit in court and appealing to President John F. Kennedy to halt construction. The United States Senate had never ratified the treaty which New York made with the Iroquois nations, and only Congress had the right to make such treaties. In the late 20th century, several tribes filed suit in land claims, seeking to regain their traditional lands by having the treaty declared invalid. The Seneca had other issues with New York and had challenged some long-term leases in court. The dispute centered around 99–year leases granted by the Seneca in 1890 for lands now in the city of Salamanca and nearby villages. In 1990 the Seneca Settlement Act was passed by Congress to resolve this long-running land dispute, requiring the state to pay compensation and provide some lands as well. The households that refused to accept Seneca ownership, fifteen in all, were evicted from their homes. The settlement cropped up again in the early 2000s. Issues arose over Seneca use of settlement lands to establish casino gaming operations, which have generated considerable revenues for many tribes since the late 20th century. On August 25, 1993, the Seneca filed suit in United States District Court to begin an action to reclaim land allegedly taken from it by New York without having gained required approval of the treaty by the United States Senate. Only the US government constitutionally has power to make treaties with the Native American nations. The lands consisted of Grand Island and several smaller islands in the Niagara River. In November 1993, the Tonawanda Band of Seneca Indians moved to join the claim as a plaintiff; it was granted standing as a plaintiff. In 1998, the United States intervened in the lawsuits on behalf of the plaintiffs in the claim. This was to allow the claim to proceed against New York; the state had asserted that it was immune from suit under the Eleventh Amendment to the United States Constitution. After extensive negotiations and pre-trial procedures, all parties to the claim moved for judgment as a matter of law. By decision and order dated June 21, 2002, the trial court held that the Seneca ceded the subject lands to Great Britain in the 1764 treaties of peace after the French and Indian War (Seven Years' War). Thus the disputed lands were no longer owned by the Seneca at the time of the 1794 Treaty of Canandaigua. The court found that the state of New York's "purchase" of the lands from the Seneca in 1815 was intended to avoid conflict with them, but the state already owned it by virtue of Great Britain's defeat in the Revolution and cession of its lands to the United States (and by default to the states in which the colonial lands were located. The Seneca appealed this decision. The United States Court of Appeals for the Second Circuit affirmed the trial court's decision on September 9, 2004. The Seneca sought review of this decision by the US Supreme Court, which on June 5, 2006, announced that it would decline to hear the case, leaving the lower court rulings in place. On April 18, 2007, the Seneca Nation laid claim to a stretch of Interstate 90 that crosses the Cattaraugus Reservation. They revoked their 1954 agreement that had granted the Interstate Highway System and New York State Thruway Authority permission to build the highway through the territory. They were retaliating for move Governor Eliot Spitzer's attempts to collect state taxes from tribal businesses operating within Seneca sovereign territory. The Seneca had previously brought suit against the state on the issue of the highway easement. The court in 1999 had ruled that the State could not be sued by the tribe. In Magistrate Heckman's "Report and Recommendation", it was noted that the State of New York asserted its immunity from suit against both counts of the complaint. One count was the Seneca Tribe's challenge regarding the state's acquisition of Grand Island and other smaller islands in the Niagara River, and the second count challenged the state's thruway easement. In 2007 the United States was permitted to intervene on behalf of the Seneca Nation and the Tonawanda Band of Seneca Indians. The United States was directed to file an amended complaint that "clearly states the relief sought by the United States in this action". In this amended complaint, the United States did not seek any relief on behalf of the Seneca Nation relative to the thruway easement. By not seeking such relief in its amended complaint, the United States permitted the action relative to the thruway easement to be subject to dismissal based on New York's immunity from suit under the Eleventh Amendment to the US Constitution. [original research?] On May 4, 2007, the Seneca Nation threatened to revoke its agreement of easement for Interstate 86. The Seneca have a diversified economy that relies on construction, communications, recreation, tourism, and retail sales. They have recently started operating two tribal-owned gaming casinos and recreation complexes. Several large construction companies are located on the Cattaraugus and Allegany Territories. Many smaller construction companies are owned and operated by Seneca people. A considerable number of Seneca men work in some facet of the construction industry. Recreation is one component of Seneca enterprises. The Highbanks Campground (reopened May 2015 after being closed in 2013) plays host to visitors in summer, as people take in the scenic vistas and enjoy the Allegheny Reservoir. Several thousand fishing licenses are sold each year to non-Seneca fishermen. Many of these customers are tourists to the region. Several major highways adjacent to or on the Seneca Nation Territories provide ready accessibility to local, regional and national traffic. Many tourists visit the region during the autumn for the fall foliage. A substantial portion of the Seneca economy revolves around retail sales. From gas stations, smokeshops, and sports apparel, candles and artwork to traditional crafts, the wide range of products for sale on Seneca Nation Territories reflect the diverse interests of Seneca Nation citizens. Seneca Tribe has decided to enter the fast-growing Medical Marijuana Industry. By doing this, Seneca will find itself growing, business wise, and participating in a business venture that in recent years is growing very quickly. According to Bill Wagner, an author writing for High Times, "Members of the Seneca Nation of Indians in western New York state voted up a referendum Nov. 3 giving tribal leaders approval to move towards setting up a medical marijuana business on their territories. The measure passed by a vote of 448-364, giving the Seneca Nation Council the power to draft laws and regulations allowing the manufacture, use and distribution of cannabis for medical purposes. "A decision on our Nation's path of action on medical cannabis is far from made", cautioned Seneca President Maurice A. John Sr. in comments to the Buffalo News. "But now, having heard from the Seneca people, our discussions and due diligence can begin in earnest." Entering the marijuana industry is thought to help stimulate the economy of the Seneca Tribe and create local business, dispensaries and other types of jobs involving medical marijuana. The price advantage of the Senecas' ability to sell tax-free gasoline and cigarettes has created a boom in their economy. They have established many service stations along the state highways that run through the reservations, as well as many internet cigarette stores. Competing business interests and the state government object to their sales over the Internet. The state of New York believes that the tribe's sales of cigarettes by Internet are illegal. It also believes that the state has the authority to tax non-Indians who patronize Seneca businesses, a principle which the Seneca reject. Seneca President Barry Snyder has defended the price advantage as an issue of sovereignty. Secondly, he has cited the Treaty of Canandaigua and Treaty of Buffalo Creek as the basis of Seneca exemption from collecting taxes on cigarettes to pay the state. The Appellate Division of the New York Supreme Court, Third Department had rejected this conclusion in 1994. The court held that the provisions of the treaty regarding taxation was only with regard to property taxes. The New York Court of Appeals on December 1, 1994 affirmed the lower court's decision. The Seneca have refused to extend these benefits and price advantages to non-Indians, in their own words "has little sympathy for outsiders" who desire to do so, They have tried to prosecute non-Indians who have attempted to claim the price advantages of the Seneca while operating a business on the reservation. Little Valley businessman Lloyd Long operated two Uni-Marts on the reservation which were owned by a Seneca woman. He was arrested after investigation by federal authorities at the behest of the Seneca Nation. In 2011 he was ordered by the court to pay more than one million dollars in restitution and serve five years on probation. In 1997, New York State had attempted to enforce taxation on reservation sales of gasoline and cigarettes to non-Indians. Numerous Seneca had protested by setting fire to tires and cutting off traffic to Interstate 90 and New York State Route 17 (the future Interstate 86). Then Attorney General Eliot Spitzer attempted to cut off the Seneca Tribe's internet cigarette sales. His office negotiated directly with credit card companies, tobacco companies, and delivery services to try to gain agreement to reject handling Seneca cigarette purchases by consumers. Another attempt at collecting taxes on gasoline and cigarettes sold to non-Indians was set to begin March 1, 2006; but it was tabled by the State Department of Taxation and Finance. Shortly after March 1, 2006, other parties began proceedings to compel the State of New York to enforce its tax laws on sales to non-Indians on Indian land. Seneca County filed a suit which was dismissed. The New York State Association of Convenience Stores filed a similar suit, which was also dismissed. Based on the dismissal of these proceedings, Daniel Warren, a member and officer of Upstate Citizens for Equality, moved to vacate the judgment dismissing his 2002 state court action. The latter was dismissed because the court ruled that he had lack of standing. In 2008 Governor David Paterson included $62 million of revenue in his budget from the proposed collection of these taxes. He signed a new law requiring that manufacturers and wholesalers swear under penalty of perjury that they are not selling untaxed cigarettes in New York. In response, the Seneca announced plans to collect a toll from all who travel the length of I-90 that goes through their reservation. In 2007 the Senecas rescinded the agreement that had permitted construction of the thruway and its attendant easement through their reservation. Some commentators have contended that this agreement was not necessary or moot because the United States was already granted free right-of-passage across the Seneca land in the Treaty of Canandaigua. As states struggled to raise revenues, in the 1980s, some state legislatures overturned longstanding prohibitions against state-sponsored gambling by authorizing state lotteries and other games of chance as a means to raise funds. In some cases, funds from such operations were earmarked for education or other worthy goals. Native American tribes asserted their right to run similar activities. With the US Supreme Court decision ruling in the late 1980s that federally recognized Native American tribes could establish gaming on their sovereign reservations, the Seneca Nation began to develop its gambling industry. It began, as states and other tribes did, with bingo. In 2002, the Seneca Nation of Indians signed a Gaming Compact with the State of New York to cooperate in the establishment of three class III gambling facilities (casinos). It established the Seneca Gaming Corporation to manage its operations. The Seneca Nation of Indians owns and operates two casinos on its territory in New York State: one in Niagara Falls called Seneca Niagara and the other in Salamanca, called Seneca Allegany. Construction began on a third, the Seneca Buffalo Creek Casino, in downtown Buffalo. In 2007 the Seneca opened a temporary casino on its land in Buffalo after federal approval, to satisfy its agreement with the state. Some citizens have opposed all Indian gambling, but especially the Buffalo location. Additional controversy has been engendered because there were questions about whether the Seneca-controlled land met other status criteria for gambling as defined in the IGRA. Some civic groups, including a "broad coalition of Buffalo's political, business, and cultural leaders", have opposed the Seneca Nation's establishment of a casino in Buffalo. They believe the operations will adversely affect the economic and social environment of the already struggling city. Opponents include the Upstate Citizens for Equality and Citizens for a Better Buffalo. In 2008 they won a lawsuit challenging the legality of the proposed casino in Buffalo, because of the status of the land. It was not part of their original reservations but had been transferred in a settlement with the state. On July 8, 2008, United States District Judge William M. Skretny issued a decision holding that the Seneca Buffalo Creek Casino is not on gaming-eligible lands. The National Indian Gaming Commission is reviewing proposed Seneca regulations and weighing its appeal options. The Seneca were given five days to respond or to face fines and a forced shutdown. They said they refuse to comply with the commission's order and will appeal. Given the declining economic situation because of a nationwide recession, in summer 2008 the Seneca halted construction on the new casino in Buffalo. In December 2008 they laid off 210 employees from the three casinos. The nation has established an official broadcasting arm, "Seneca Broadcasting", to apply for and purchase radio station licenses. The company owns one commercial FM radio station (broadcasting at 105.9 MHz) licensed off-reservation to the village of Little Valley, which the company purchased from Randy Michaels in early 2009. That station, known as WGWE, signed on February 1, 2010 from studios in the city of Salamanca with a classic hits format. An earlier application, for a noncommercial FM station at 89.3 in Irving, New York, ran into mutual exclusivity problems with out-of-town religious broadcasters. Many Seneca people are employed in the local economy of the region as professionals, including lawyers, professors, physicians, police officers, teachers, social workers, nurses, and managers. ^ "Culture". Seneca Nation of Indians. Archived from the original on 19 October 2015. Retrieved 10 October 2015. ^ "Saint George, the Serpent". crookedlakereview.com. Archived from the original on 31 October 2015. Retrieved 10 October 2015. ^ "Canandaigua Lake, N.Y.: Of Indian Legends and Sylvan Trails". The New York Times. 1 October 2006. Archived from the original on 14 February 2017. ^ "Bare Hill Unique Area". ny.gov. Archived from the original on 23 September 2015. Retrieved 10 October 2015. ^ a b "Who Built the "Old Fort" on Bare Hill". crookedlakereview.com. Archived from the original on 23 September 2015. Retrieved 10 October 2015. ^ Bruce E. Johansen; Mann, Barbara Alice (2000). "Ganondagan". Encyclopedia of the Haudenosaunee (Iroquois Confederacy). Greenwood Publishing Group. p. 105. ISBN 978-0-313-30880-2. Retrieved 2010-05-23. ^ Parker, Arthur. The History of the Seneca Indians. Ira J. Freidman (1967); Empire State Historical Publications Series, XLIII, p. 13-20. ^ Folts, James D. The Westward Migration of the Munsee Indians in the Eighteenth Century, The Challenge: An Algonquian Peoples Seminar.Map 4. Albany: New York State Bulletin No. 506, 2005. p. 32. ^ Wallace, Paul A. W. (1965). Indian Paths of Pennsylvania. Map 5. Harrisburg, Pa: Pennsylvania Historical and Museum Commission. ^ NYCD 13:114,121,124,177-178, 184; See also The Senecas and the First Esopus War. NYCD, 13: 184-185.) In 1663 after the Second Esopus War, a Minnisink chief reported that the Seneca threatened to attack him (NYCD, 13:361. ^ NYCD, 4:98-99 "Seneca Power Over the Minnisink Indians"
^ a b Herbert C. Kraft, The Lenape: Archaeology, History and Ethnography (Newark, N.J.:New Jersey Historical Society, 1986), p. 230. ^ Grumet cites the Colonial Records of Pennsylvania, 8: 416)) By the end of the eighteenth century, the Munsee who had previously migrated to the upper Susquehanna region were living in Seneca communities. ^ a b c Raphael, Ray (2001). A People's History of the American Revolution: How Common People Shaped the Fight for Independence. New York: New Press. p. 243. ^ "The League of the Iroquois | The Gilder Lehrman Institute of American History". www.gilderlehrman.org. 2011-11-29. Archived from the original on 2016-05-30. Retrieved 2016-04-26. ^ Raphael, Ray (2001). A People's History of the American Revolution: How Common People Shaped the Fight for Independence. New York: New Press. p. 244. ^ Raphael, Ray (2001). A People's History of the American Revolution: How Common People Shaped the Fight for Independence. New York: New Press. pp. 244–245. ^ a b c d Graymont, Barbara (1972). The Iroquois in the American Revolution. Syracuse, NY: Syracuse University Press. pp. 71–72. ^ a b c d Raphael, Ray (2001). A People's History of the American Revolution: How Common People Shaped the Fight for Independence. New York: New Press. p. 245. ^ a b c Raphael, Ray (2001). A People's History of the American Revolution: How Common People Shaped the Fight for Independence. New York: New Press. p. 246. ^ a b Raphael, Ray (2001). A People's History of the American Revolution: How Common People Shaped the Fight for Independence. New York: New Press. p. 247. ^ Raphael, Ray (2001). A People's History of the American Revolution: How Common People Shaped the Fight for Independence. New York: New Press. pp. 247–248. ^ Raphael, Ray (2001). A People's History of the American Revolution: How Common People Shaped the Fight for Independence. New York: New Press. p. 248. ^ Raphael, Ray (2001). A People's History of the American Revolution: How Common People Shaped the Fight for Independence. New York: New Press. pp. 248–249. ^ Raphael, Ray (2001). A People's History of the American Revolution: How Common People Shaped the Fight for Independence. New York: New Press. pp. 249–250. ^ a b Raphael, Ray (2001). A People's History of the American Revolution: How Common People Shaped the Fight for Independence. New York: New Press. p. 250. ^ Raphael, Ray (2001). A People's History of the American Revolution: How Common People Shaped the Fight for Independence. New York: New Press. pp. 250–251. ^ a b c Raphael, Ray (2001). A People's History of the American Revolution: How Common People Shaped the Fight for Independence. New York: New Press. pp. 251–252. ^ a b c d Raphael, Ray (2001). A People's History of the American Revolution: How Common People Shaped the Fight for Independence. New York: New Press. p. 254. ^ a b Raphael, Ray (2001). A People's History of the American Revolution: How Common People Shaped the Fight for Independence. New York: New Press. pp. 252–253. ^ Raphael, Ray (2001). A People's History of the American Revolution: How Common People Shaped the Fight for Independence. New York: New Press. p. 253. ^ a b c Ferling, John (2015). Whirlwind: The American Revolution and the War That Won It. New York: Bloomsbury Press. p. 238. ^ Ferling, John (2015). Whirlwind. New York: Bloomsbury Press. pp. 239–240. ^ a b Ferling, John (2015). Whirlwind. New York: Bloomsbury Press. p. 240. ^ Ferling, John (2001). Whirlwind. New York: Bloomsbury Press. p. 241. ^ Raphael, Ray (2001). A People's History of the American Revolution: How Common People Shaped the Fight for Independence. New York: New Press. p. 255. ^ Raphael, Ray (2001). A People's History of the American Revolution: How Common People Shaped the Fight for Independence. New York: New Review. pp. 242–243. ^ Raphael, Ray (2001). A People's History of the American Revolution: How Common People Shaped the Fight for Independence. New York: New Press. p. 256. ^ a b c Raphael, Ray (2001). A People's History of the American Revolution: How Common People Shaped the Fight for Independence. New York: New Press. p. 257. ^ Raphael, Ray (2001). A People's History of the American Revolution: How Common People Shaped the Fight for Independence. New York: New Press. p. 258. ^ a b "Founders Online: From George Washington to John Hanson, 26 September 1782". founders.archives.gov. Archived from the original on 15 February 2017. Retrieved 2016-04-28. ^ Merrill at pp 90–97. ^ McKeveley, Blake (January 1939). "Historic Aspects of the Phelps and Gorham Treaty of July 4–8, 1788" (PDF). Rochester History. Rochester Public Library. 1 (1). ISSN 0035-7413. Archived from the original (PDF) on 2007-12-03. Retrieved 2008-01-05. ^ "Birth of a Nation". Seneca Nation of Indians. 2013. Archived from the original on 2014-07-25. Retrieved 2013-11-18. ^ Bilharz, Joy Ann (1998). The Allegany Senecas and Kinzua Dam: forced relocation through two generations. Lincoln: University of Nebraska Press. p. 55. ISBN 0-8032-1282-8. Retrieved 2009-10-19. ^ Zito, Selena (June 5, 2011). Smokes cheap, tensions high. (Also titled "Portrait of a Failed American City.") Pittsburgh Tribune-Review. Retrieved July 28, 2012. ^ a b c Staba, David; Belson, Ken (4 Jul 2007). "Temporary Seneca Casino Opens in Downtown Buffalo". New York Times. Archived from the original on August 23, 2014. Retrieved March 24, 2009. ^ "Seneca Indian Law Suit, Grande Island, NY". isledegrande.com. Archived from the original on 2016-03-03. ^ "SENECA NATION OF INDIANS v. NEW YORK" (PDF). Findlaw. Archived (PDF) from the original on 15 September 2004. Retrieved 10 October 2015. ^ "Highbanks Campground". Highbanks Campground. Archived from the original on 11 October 2015. Retrieved 10 October 2015. ^ "Seneca Indian Nation Approves Medical Marijuana Initiative". High Times. Archived from the original on 2016-03-05. Retrieved 2016-02-25. ^ "Honor Indian Treaties - Learn More". honorindiantreaties.org. Archived from the original on 4 July 2007. Retrieved 10 October 2015. ^ "Snyder v. Wetzler, 193 A.D.2d 329" (PDF). upstate-citizens.org. Archived from the original (PDF) on 2014-08-23. Retrieved 5 May 2018. ^ Chapman, Chris (2007-11-21). "Local Man; Business Targets Of Multi Agency Raids" Archived 2012-04-21 at the Wayback Machine, The Salamanca Press. Retrieved 2011-07-10. ^ "Cigarette sales scheme gets man 5 years’ probation" Archived 2011-07-14 at the Wayback Machine, The Buffalo News (2011-07-09). Retrieved 2011-07-10. ^ "Frens v State of New York (2006 NY Slip Op 51994(U))". state.ny.us. Retrieved 10 October 2015. ^ "Warren v. Spitzer, Billet, Poloncarz and Erie County". upstate-citizens.org. Archived from the original on 2016-03-03. Retrieved 10 October 2015. ^ Gryta, Matt (2011-06-21). Setback spurs Senecas to top N.Y. appeal Archived 2011-06-24 at the Wayback Machine. The Buffalo News. Retrieved 2011-06-22. ^ a b Chapman, Chris. "Battle for Buffalo Creek: Notice of Violation doesn't change operations", Salamanca Press. ^ "NorthEast Radio Watch by Scott Fybush". fybush.com. Archived from the original on 19 October 2015. Retrieved 10 October 2015. ^ VanRyzin, Robert R. (29 October 2009). Fascinating Facts, Mysteries and Myths About U.S. Coins. Krause Publications. p. 10. ISBN 978-1440206504. ^ "Chief Cornplanter". Pennsylvania Historical and Museum Commission. Archived from the original on 2015-03-07. Retrieved 2015-05-02. ^ Lester, Patrick D. (September 1995). The Biographical Directory of Native American Painters (First ed.). University of Oklahoma Press. ISBN 978-0806199368. ^ a b c d e "Historic Seneca Leaders". Seneca Nation of Indians. 2012. Archived from the original on 2015-05-09. Retrieved 2015-05-02. ^ Porter, Joy (2001). To Be Indian: The Life of Seneca-Iroquois Arthur Caswell Parker, 1881-1955. Norman, Oklahoma: Oklahoma University Press. p. 5. ISBN 0-8061-3317-1. ^ Morris, Robert (1 January 1897). A history of the treaty of Big Tree : and an account of the celebration of the one hundredth anniversary of the making of the treaty, held at Geneseo, N.Y., September the fifteenth, eighteen hundred ninety-seven. Dansville NY: Bunnell. ISBN 978-1429734288. Cadwallander Colden, The History of the Five Indian Nations: Depending on the Province of New York in America. New York: Cornell University Press, 1958. William Cronon, Changes in the Land: Indians, Colonists, and the Ecology of New England. New York: Hill and Wang, 1983. John Ferling, Whirlwind: The American Revolution and the War That Won It, New York: Bloomsbury Press, 2015. Barbara Graymont, The Iroquois in the American Revolution, Syracuse, NY: Syracuse University Press, 1972. Laurence Marc Hauptman, In the Shadow of Kinzua: The Seneca Nation of Indians since World War II. Syracuse, NY: Syracuse University Press, 2014. Francis Jennings, The Ambiguous Iroquois Empire: The Covenant Chain Confederation of Indian Tribes with English Colonies. New York: W.W. Norton & Company, 1984. Bruce E. Johansen, Dating the Iroquois Confederacy. n.d.
Robert H. Keller & Michael F. Turek, American Indians & National Parks. Arizona: University of Arizona Press, 1998. Ray Raphael, A People's History of the American Revolution: How Common People Shaped the Fight for Independence, New York: New Press, 2001. Daniel K. Richter, The Ordeal of the Longhouse: The Peoples of the Iroquois League in the Era of European Colonization. Chapel Hill, NC: University of North Carolina Press, 1992. Allen W. Trelease, Indian Affairs in Colonial New York: The Seventeenth Century. Ithaca, NY: Cornell University Press, 1960. Anthony F.C. Wallace, The Death and Rebirth of the Seneca. New York: Vintage Books, 1969. Jeanne Winston Adler, Chainbreaker's War: A Seneca Chief Remembers the American Revolution. New York: Black Dome Press, 2002. Wikimedia Commons has media related to Seneca nation.